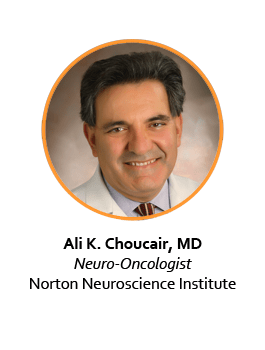 Ali K. Choucair, M.D., cares for patients at the Brain Tumor Center, a collaboration between Norton Neuroscience Institute and Norton Cancer Institute. It’s the only center of its kind in the region featuring a team of fellowship-trained physicians specializing in advanced tumor treatment. The team includes a neuro-oncologist, neurosurgeon and radiation oncologist. Additional providers in the brain tumor center include speech pathology, rehabilitation medicine, behavioral oncology, social work, and a neuro-oncology nurse navigator. Dr. Choucair earned his undergraduate degree in biochemistry from Rice University, Houston, Texas, and his medical degree from University of Calgary School of Medicine, Alberta, Canada, where he also completed a residency in internal medicine. He then completed a residency in neurology at University of Utah Medical Center, Salt Lake City. Dr. Choucair went on to complete fellowships in neuro-oncology at University of California San Francisco Neuro-oncology Services and UCSF’s Brain Tumor Research Center. Dr. Choucair is the principal investigator for an international cooperative clinical trial for patients with brain tumors and is a member of the radiation therapy oncology group (RTOG) CNS tumor committee. He is certified by the American Board of Psychiatry and Neurology.